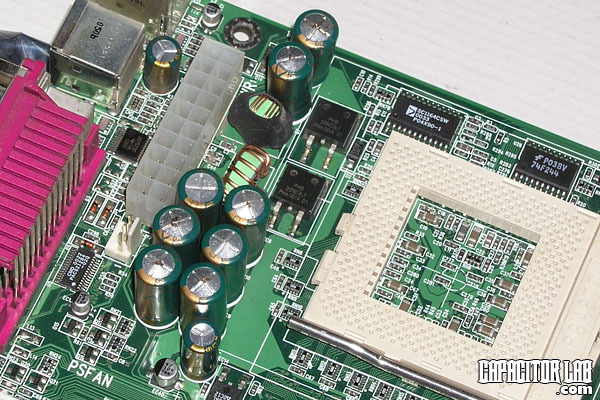 It should be emphasised that capacitors do not always show visible signs of failure. They can end up all dried up inside or be shorted or open and still look normal. 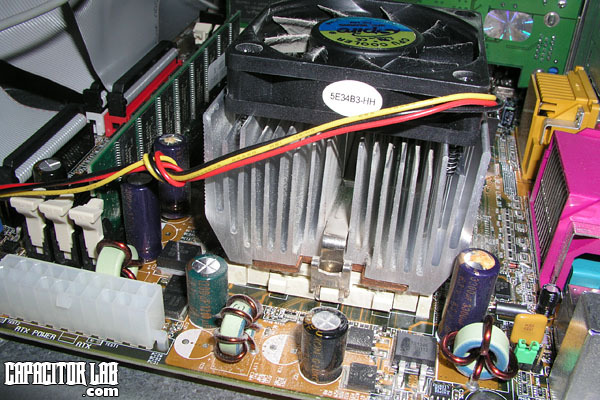 Problems with the computer can also occur while capacitors are in early stages of failure before they start to show visible signs of failure, simply because they are operating below the specification that the computer circuits require from them. Let's look at the two main types of visible failure. Because the chemical reaction inside the capacitor when it fails can produce hydrogen gas, capacitors have vents cut into the tops of their aluminium cans. These are intended to break and release the gas that has built up inside the capacitor. The vents differ according to the brand of capacitor with popular shapes being X, K, T, a mercedes type logo or various other types of vent. So a capacitor which has failed can show bulging at the top. This can be accompanied by a tiny deposit of dried electrolyte in the middle of the top. The electrolyte discharge can also be larger covering the top of the cap with a dried substance which can be black, orange, brown, white or a similar colour. The bulging could be only slight or it could be quite obvious with possibly even the vents being completely broken. 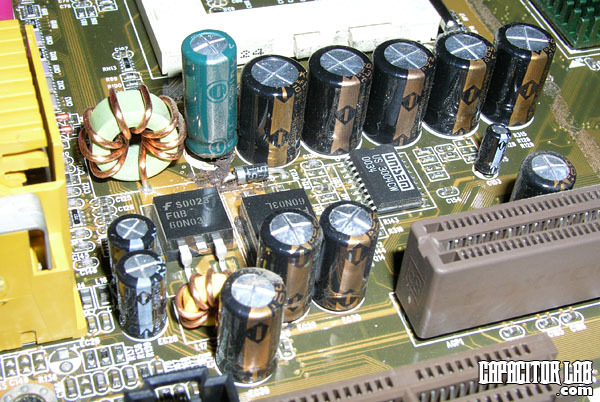 The first photograph above shows Chhsi capacitors which have failed on an MSI board. Seven capacitors are obviously bulging whilst one looks normal. In this case we would not leave the normal looking capacitor but we would replace that as well as the other bulging capacitors. We would do that because it is the same brand as the bulging capacitors which have already proven to us that they are unreliable. The above photo shows Jackcon capacitors which have failed and are slightly bulging. Whilst the Chhsi capacitors in the first photo show a black electrolyte, the Jackcon show an orange colour. This can simply be attributed to the different chemical composition of the electrolyte. To the right of the above photo you can see a purple GSC capacitor which is leaking from the top it's typically very orange electrolyte. The capacitor cans are sealed at the bottom with a bung. This is usually made of a synthetic rubber called EPT or Ethylene-Propylene Terpolymer. In low quality capacitors it can be made of natural rubber which shrinks with age. Also the seal may simply not be strong due to the manufacture of the capacitor. So what can happen is that instead of the gas and electrolyte being released at the top of the capacitor via the vents, the capacitor instead pushes the bung out somewhat and leaks electrolyte on the board. Because the board is upright the electrolyte can make a trail down the board quite a distance. Whilst electrolyte can be corrosive there has not been reports of traces or components damaged by leaking electrolyte. 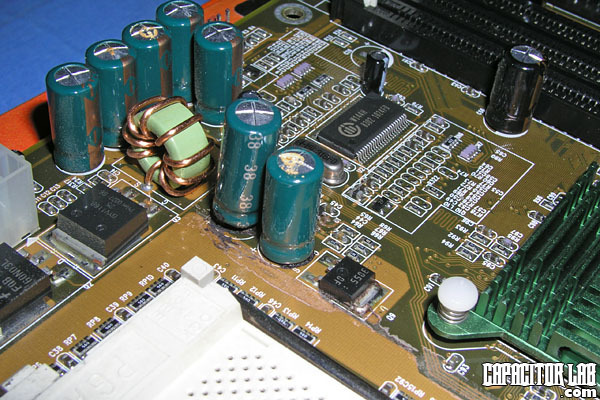 When the capacitors are replaced the electrolyte can be cleaned up with a cotton swab and some isopropyl alcohol which will not damage components as it will evaporate. In the above photo a Jackcon capacitor can be seen to be leaning. This is one indicator that the bottom bung of the capacitor may have been pushed out. There is also a trail of dried brown electrolyte. 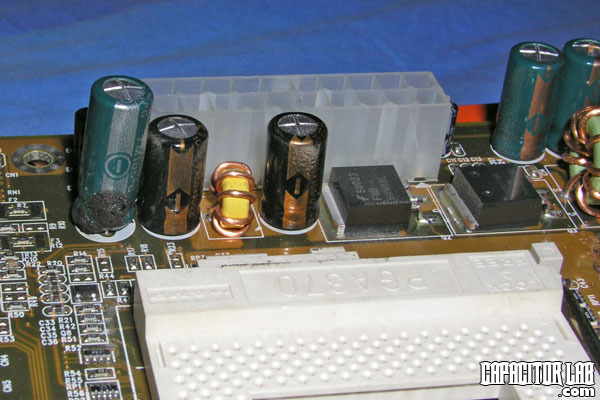 Note that there is no electrolyte leaking from the top of the capacitor although it is slightly bulged. It should be emphasised however that capacitors which have not failed may be leaning because that was the way they were installed on the board or they may have been disturbed by the user during handling of the board. Therefore it is necessary to look for other signs like dried electrolyte around the bottom of the capacitor or on the board. 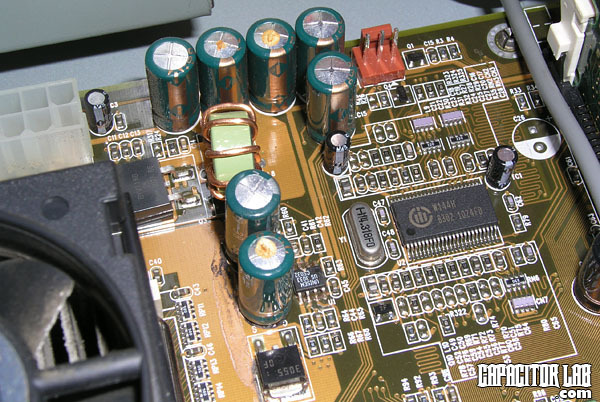 Look at the bottom of the capacitor and it may be possible to see the black bung poking out somewhat and raising the capacitor off the motherboard. If we look at the green Jackcon capacitor at the left of the photo we can see that it is not only leaning but the dark coloured electrolyte has dried around the bottom part of the capacitor because again the bung has been pushed out. Above we can see the second last green capacitor on the right is also leaning for the same reason. We can see that the electrolyte has actually made a long trail which actually went as far as the top of the AGP slot. It was no problem to replace all those capacitors, clean the electrolyte and restore the board to stable operation again.